The Daughters of Rebekah, also known as the Rebekahs and the International Association of Rebekah Assemblies, is an international service-oriented organization and a branch of the Independent Order of Odd Fellows. It was initially designed as the female auxiliary of the IOOF, but now allows both female and male members. An 1898 print depicting various themes related to the work of the Rebekah Lodges. 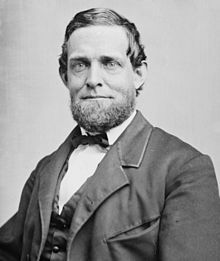 Schuyler Colfax, U.S. Vice-President from March 4, 1869 – March 4, 1873. Annual pilgrimages to the "Tomb of the Unknowns" (Arlington National Cemetery, USA), and other Tombs of the Unknown Soldier. Be involved in leadership training applicable to everyday life. Have a more purposeful life. Develop enduring friendships far and wide. Become an active participant in your community. help children, the elderly, and the less fortunate. develop an inner satisfaction that money cannot buy. have a warm friendly welcome in strange cities and distant lands. have companionship at a time of loneliness. enlarge your circle of friends.